In 2021, Rosalind Franklin will roll off Kazachok onto the red dirt of Mars. 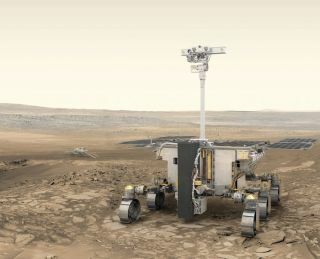 Artist's illustration of Europe's ExoMars rover "Rosalind Franklin" (foreground) and Russia's stationary surface science platform “Kazachok” (background) on the surface of Mars. Less than two years from now, Rosalind Franklin will roll off Kazachok onto the red dirt of Mars. Rosalind Franklin is the European rover that will hunt for signs of Red Planet life after touching down in February 2021. The moniker, which was announced last month, honors the pioneering crystallographer who helped figure out the double-helix structure of DNA. And Kazachok is the newly revealed name of the Russian-built landing platform that will serve as Rosalind Franklin's base, while also doing a lot of science work of its own. "Kazachok literally means 'little Cossack,' and it is a lively folk dance," European Space Agency (ESA) officials said in a statement today (March 21). That dance, in turn, takes its name from the Cossack people. The Cossacks originally hailed from "the northern hinterlands of the Black and Caspian seas. They had a tradition of independence and finally received privileges from the Russian government in return for military services," according to the Encyclopedia Britannica. Together, Rosalind Franklin and Kazachok comprise the second phase of the two-part ExoMars program, a collaboration between ESA and Roscosmos, Russia's federal space agency. Phase 1 launched the methane-sniffing Trace Gas Orbiter (TGO) and a landing demonstrator called Schiaparelli in March 2016. Rosalind Franklin will search for signs of ancient Red Planet life, aided by a drill that can reach up to 6.5 feet (2 meters) underground. The stationary Kazachok will study the Martian climate and atmosphere, measure radiation levels, and look for evidence of water in the platform's surroundings, ESA officials said. The platform destined to land on Mars as part of the next ExoMars mission arrived in Italy from Russia for final assembly and testing on March 19, 2019. Kazachok arrived in Turin, Italy, from Russia on Tuesday (March 19). The landing platform and the rover have already passed a number of tests, but many more await the duo before their planned launch from Kazakhstan in July 2020. "We have now a very challenging schedule of deliveries and tests both in Italy and France," François Spoto, ESA's ExoMars team leader, said in the same statement. "The coordination between the Russian and European teams is key to ... reach[ing] the Baikonur Cosmodrome [on time] in 2020." NASA plans to launch its own life-hunting rover in July 2020. That robot is currently known as Mars 2020, but it will soon be named by a schoolchild following a nationwide competition, as has happened for other NASA rovers.